THE BASE IS STAMPED "DENBY MADE IN ENGLAND". A VERY USEFUL AND STYLISH PIECE OF KITCHENALIA FROM THIS EVER POPULAR MAKER. 8 CHEVRON BANDS. GREAT ADDITION TO YOUR COLLECTION. 9CMS BASE DIA X 15.5CMS HIGH. Denby Amethyst - 10.75" Dinner Plate. Mixture of firsts and seconds. Backstamp may vary. 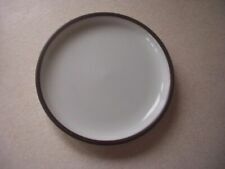 Denby Metz Green and Blue Dessert or Salad Plate New/Unused - 1st Quality-BNWT. 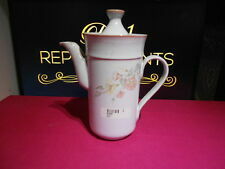 It is new, never used and first quality still with the Denby Sticker as shown. The stickers may vary. 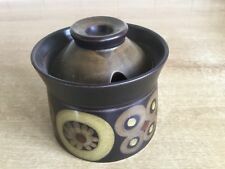 Denby Jug Spice Brown /Orange 1 Pint Milk / Water Jug Vgc H 5.75"
Denby Dark Brown Glaze with Orange Glaze inside, 1 pint milk jug. In good condition. Think it was from the Spice range. DENBY - DAMASK SALAD / SIDE PLATES, 21.5cm across, very pretty design. Very pretty Denby Damask salad / side plate. Approx 21.5cm across. Thanks for looking at these six superb Denby Cotswold cups and saucers all in fabulous condition with no damage. Sgraffito inscised with grinning faces in white on a matt black textured ground, c.1956. designed by Tibor Reich. Denby Greenwich - Craftsman Mug Tea/Coffee. New Denby Spirit Blue Limited Edition Vase No.564 out of 1000. Number 564 out of a limited edition of 1000 with certificate included. On the steel: Denby, England. The Spoon is in very good bright condition. special size boxes, the real killer is parcel tape! obtained for everything so if there are any delays. Item Weight: 50g. We have for sale this handled jug from the ‘Arabesque’ range by Denby. Denby Stonewear x3 Cups and Saucers Pattern Romance. Factory first quality - the base of the teapot carries the full Denby, England backstamp to the base (as shown in photo 7). The capacity of the teapot is 1 pint. Open Sugar Bowl. in one of their iconic designs of the 1980/90s. In Very Good condition, there are no obvious signs of use. Ideal to replace those broken or missing pieces or add to your existing service. 2 DENBY REGENCY GREEN SMALL OVAL SERVING DISH LASAGNE GRATIN Vegetable Oven Pair. 2 dishes no chips or cracks , some internal staining from regular use. See photos for size and condition Dispatched with Royal Mail 2nd Class. 2 X Denby Azure Green Dinner Plate 10.25" diameter. Dispatched with eBay delivery – Shutl 2-3 days. Le Creuset Orange Teapot. Condition is Used. Very clean interior, no stains or crazing. Minimal use, no chips or scratches on exterior. Dispatched with Royal Mail 1st Class. 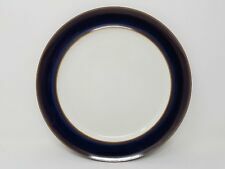 Denby base mark. The Bowl is in very good bright condition. special size boxes, the real killer is parcel tape! obtained for everything so if there are any delays. Item Weight: 510g. We re-use boxes in the. DENBY INDIVIDUAL COVERED SOUP BOWLS X 4 LIDS X 3.